We have learned over the years that a lot of ScanMyPhotos customers use their photo scanning project as a jumping off point for a larger genealogy project that tells their family’s entire story. Choose one branch of your family to focus on first. Will it be your mom’s side of the family, your dad’s, or will you start with your spouse’s family? If you try to do every branch of your family at once, you run the risk of getting overwhelmed and stopping before you can finish. 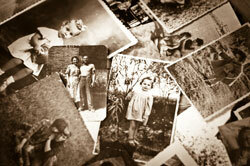 Pull together all of the paperwork, photos, documents, and family heirlooms you have. Let your family know that you are working on this project and ask them if they have anything to contribute (photocopies are fine!). Public records like birth, marriage, and death records, land deeds, and immigration records may or may not be digitized. Once you exhaust your online search, call local government agencies and enlist their help. Schedule time to interview older relatives – parents, grandparents, aunts, uncles, cousins – and gather their stories from childhood and young adult hood. Record everything on a digital voice recorder and download the interviews to your computer. You might be amazed at what you find online. Start with pedigree databases, genealogy-specific message boards, and the FamilySearch.org, the online version of Salt Lake City’s Family History Library, for example. Now that you have all the supporting documentation you can get your hands on, start entering everything into a pedigree or family tree chart. When you are done, consider publishing a book for yourself and your family members to enjoy. Don’t forget that if you get stuck at any time, you can always enlist the help of other family members or even an expert, which you can find at ProGenealogists. This entry was posted in Uncategorized and tagged family tree, genealogy, research by Mitch Goldstone. Bookmark the permalink.